The massacre was to occur on the 22d of March, 1622, a little before noon, at a time when our men were all at work abroad in their plantations, dispersed and unarmed. 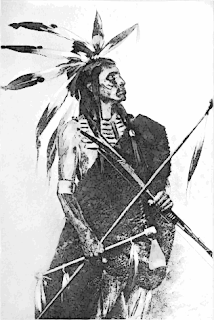 The Indians were so familiar with the English that they borrowed their boats and canoes to cross the river when consulting with neighboring Indians on the conspiracy. So well planned was the massacre, that the evening before, they brought presents of deer, turkey, fish and fruits to the English. And during the morning of the massacre, they came freely and unarmed, eating and taking refreshment with the unsuspecting English and were so engaged until the very minute that the plot was executed. Then they commenced knocking the English unawares on the head, with their tomahawks, hoes and axes. Those who escaped were shot. No one was spared, not man, woman or child. A count of three hundred and forty-seven persons was made of the Christians murdered that morning. Source: The History of Virginia, in Four Parts, by Robert Beverley; 1616 letter of Capt. John Smith. of Opechancanough to the imperial crown, the Englishmen appeared to be lulled into a fatal security as they became more familiar with the Indians, eating, drinking, and sleeping among them. This sort of friendship afford the Indians the wisdom of the strength of the English and the use of our arms. They knew at all times, when and where to find the people; whether at home, or in the woods; in bodies, or dispersed; in condition of defense, or indefensible. Once this knowledge spread throughout the tribe and the weakness of the English was exposed, a plan was hatched to reduce the size of the colony.